A lot of people have said this before. Why am I saying this? Because of this setting. Who is the default handler of URLs? The browser. So who should decide how an URL should be opened, the browser or the application which contains the url? In my opinion, this right belongs to the browser. Now all the URLs I access open in the same way (New tab window in Firefox) no matter from which application I access them from. 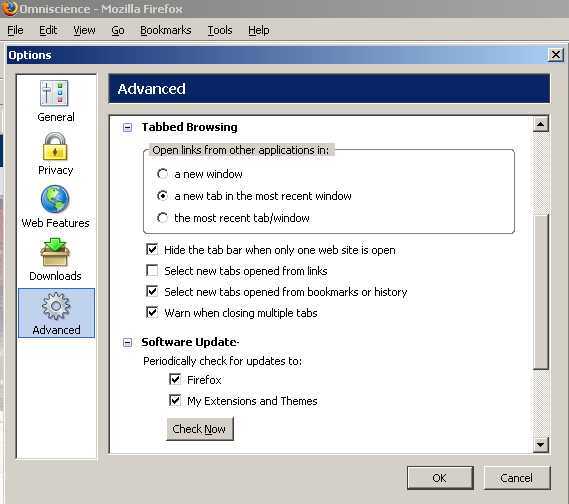 I have been using alternate browsers since more than 2 years now and I have tried Opera v7 to 7.5 and Firefox 0.93. But it took this feature this feature of Firefox to make this browser my "default" browser. Opera has this feature to save the last open windows on exit and open them again on browser restart. A killer feature, and I would love to have it in Firefox. I am back to Delhi after spending more than half of November on vacation in Jaipur. I had fewer problems of cold in Bangalore although I did have some cough problems due to allergy because of the humid weather. Life has been directionless of late. I have been trying to organize my thoughts to find some direction but as of now, I don't know what I want to do.